An artist or band that outshines others during live performance is the best kind. With so much technology behind studios these days it is commonplace that most of the talent and skill come from the engineer, not the artist. As Kanae's vote has yet to be cast, I found this category hard to decide upon as I have only seen a couple of bands on the list. There are so many of them that I would love to see live. Unfortunately, I have either missed their shows, or I am going to see them in the future. Arkells, Tokyo Police Club, Diamond Rings, Land of Talk, Cuff the Duke, and The Golden Dogs are all on my "must-see" list. So for now, considering the fact that I have actually seen this band, I will give my vote to "Arcade Fire". I was fortunate to see them twice in one week: both during the Chicago's Lollapolooza and a show on Toronto Island. You can read the live show review by clicking here. I still clearly remember when the entire crowd joined together and sang " Wake up". It echoed throughout the whole island and it was beautiful to see the many people singing the same song all at once! Being a part of it was priceless. 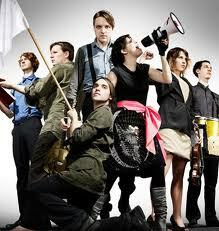 My vote for best live act 2010 - Arcade Fire.